I haven’t read the book but have met Mr Shermer face-to-face twice to discuss the Holohoax and 666isMONEY. Has Mr. Shermer considered the opposite of a “Market Economy” i.e., a Moneyless, Non-Market Economy? Many famous people believed in eliminating money, including Jesus (if he existed), Karl Marx, Nikoli Bucharin, Plato (the “Guardians” were NOT allowed to have money), Tolstoy, Bertrand Russel, Buddha, Saint Francis of Assassi, Saint Thomas Moore (“Utopia”), Edward Bellamy (“Looking Backward”), Pol Pot, Fidel Castro, Muammar Gadafi. A truely evolved civilization does NOT require money. I hope Mr Shermer allows this comment and responds. More info at my website. What a political rogue’s gallery! Those fellows you name have one thing in common… all were/are utopians. But even in utopian societies there has to be some standard of trade such as, “I’ll give you a bushel of the apples I grew for a bushel of your ears of corn.” Might as well have money so that everything is valued according to an established standard to facilitate trade. I am so happy that Mr. Shermer is turning his powerful intellect and rational thought processes to understanding and explaining the market to a mass audience. As for Ms. Baranow’s comment, I would answer: No market can truly exist with freedom. A market consists, SOLELY, of free actors acting freely. Some would replace the phrase “free actors” with “consenting adults.” However it is phrased, the point is that markets, to exist at all, require free actors to act freely. If those free actors, then, determine (freely) that money is a useful facilitator — a means of transacting those free actions, then those actors will use money. If they freely choose some other way of facilitating the transaction, money will cease to exist. Put another way, money has most emphatically NOT been imposed by sinister outside forces or corrupt governments, it has been invented by the grassroots economic actors as a means of carrying on commerce. Sinister forces may then attempt to control or corrupt the use of money, but that is a different issue. To repeat: consenting adults have created, and continue to use, money in pursuance of their freely-determined self interest. What could be more civilized than that? Anything beyond a Stone Age existence requires exchange, a division of labor. If you and your family or tribe had to make everything you used, you would be limited to the same standard of living as paleolithic humans had. And to have a division of labor, in which people specialize at making different things and performing different services, you need trade. And to have trade beyond simple, inefficient barter, you need a medium of exchange, i.e., money. In short, the more evolved (i.e., complex, because we’re not using “evolved” in the true Darwinian sense) a society, the more it needs money. I am happy to see that Michael Shermer has combed new territory in his knowledge, lecturing, and teaching. This new book certainly looks to be one of his most fascinating works about how we all work together (as organisms) and how we reached this current state of civilization and culture. I’ve been fascinated reading your new book and frequently invoke points that you’ve made when debating with friends about certain science and religon issues. The one area that I have trouble with is seeing how an unregulated free market can even begin to tackle the massive change that needs to occur in order to combat climate change. We need a complete revision of the energy sector and I don’t see how that can happen without strong government-led action. If anything, it seems to me that the last century has only shown us that without established standards and enforcable environmental law industry heads down a road that we end up regreting. I’m curious where you stand on all of the climate change plans that have been proposed by the current democratic candidates. Franklin, I think what Raquel was talking about is about altruism. If you read Marx and all the utopians she quoted, they all focus on the altruism of humanity. Division of labor etc, are done by means of being altruistic to one another. In a sense, in a total utopia, everyone will be kind to one another, and the whole concept of maximising utility for oneself is suppressed… hence the lack of need for money. The free market will provide the incentive for an articulate scientist to debunk all the ridiculous “science” which you have inhaled if you believe that the climate has changed or will change because of human activity. Fortunately for you, our country doesn’t believe in government strong-arming people like into believing the truth. I enjoyed your presentation at Cato on C-Span 2. Your study of the evolutionary forces at work in shaping human society is an inspiration. Your conclusions strengthen my apprehension and appreciation of the laissez faire regime. Your answer to the question lamenting the public ignorance of economics was very instructive, namely that the apprehension and appreciation of the evolutionary market economy is also evolutionary. However, I found your suggestion that political contrivances (rule of law, etc. )are somehow essential to the market stability to be incongruent. It seems to me that politics is opportunistic and parasitic (ref. Bastiat) whereas economics is creative, productive and humane. How does politics provide order lacking in the market without any science or knowledge of such? Okay, I bought the book, only got as far as the 4th Chapter and had to put it down. I wrote an unfavorable review for Amazon. The preface to the book was the most revealing! Did U know Shermer was an evangelical Christian?! He also studied economics with ppl who love Ayn Rand! Ms. Baranow – Mr. Shermer obviously believed stupidities in the past (evangelical Christianity). He no longer does. Can you say the same? The answer is that, in a free society, it would be up to the scientists to tell us that the world was heating up and we were responsible for it. It would then be up to us to decide if we cared enough to do something about it. If we did care, we would voluntarily change our consumption patterns. Any ACTUAL (as apposed to potential) problems would be dealt with by the market. The idea that an all-powerful government should FORCE us to save ourselves is unethical. Friends, friends! You get so-o-o intellectual here. I perceive that the markets and government operate just like one human mind. Some part of us says, “Maximize your profit!” Another part says, “Make your resources last!” Sometimes we chase profit too long and get burned. Other times we are hoard our resources too long and miss an opportunity. 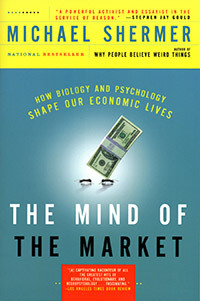 I thought “The Mind of the Market” hit many high spots but wandered quite a bit in topics. I bought the book hoping to focus on the evolutionary forces working in the market economy and individual choices therein. Often I found myself saying, “I don’t think we’re in Kansas anymore.” The chapter, “The Value of Virtue” was an example of time spent on moral emotions. One of the strongest sections began on p. 252 with the discussion of trade as a bonding agent between tribes/countries. Bistiat’s maxim, “Where goods do not cross frontiers, armies will” reveals great insight to human behavior. And yet, I think there is something deeper here that bridges divides in addition to trade. That is when we can begin to tell good people from bad among a different tribe/race. This the transition point that allows trust and trade to begin with those selected people just as we do with our known group. I was aware of this in myself as I came to know more black people. I was uncomfortable when I could not tell a good black person from a bad black person. I realized I interacted with lots of white people that were good and bad, but that didn’t make me cautious about whites. I soon realized it was because I could spot good from bad and acted accordingly. I have since learned that is gating item for me with all different groups with which I interact. I downloaded Mr. Shermer’s talk at the Cato Institute, and got about 30 minutes in before deciding that I would no longer belong to the Skeptics Society because of the pro-market babble this gentleman was spewing. It was about when he cites Google as so being so beatific and exemplary that I couldn’t stomach the bubble-headed claptrap any more. There is nothing to talk about – when a professor and author and writer can be so autistic about such essential matters, seeing fairies and goodness sweeping oe’r his wonderland of $187 million CEO golden parachutes and bloated billionaire criminal robber barons, there has to be more than polite demurral. I heard your interview on the Leonard Lopate show on WNYC, member station of NPR, and loved it! I will be sending you an e-mail to the address listed below. Well you gave an audience to a some rather far fetched ideas like a holocaust denier . On one hand you did portray “The Secret” as mean sprit ed mysticism on the other you tried portray capitalism as some Utopia . After I read the book I wanted to make critical comments. But then I read some reviews and decided that I wanted to tell people to read the book. I have further comments on my blog.